If there's any you think I might have missed, feel free to let me know. Hmm, they are similar, but not quite the same (which is probably why I didn't catch it). I'll add that to my to-do list, thanks. Hmm.. I don't really think the security camera is a hidden mickey. When I noticed the Tetris thing when I was watching T:L for like the eighth time, I laughed way too hard. Dillinger Jr, when he's going through his computer screens to shut down the Marv hack at Encom, you can see in the lower left corner that Tetris has been assigned to an F-key. A lot of the video could probably be watched without audio, if you remember the dialogue from the movies well enough. The non-dialogue comparison elements can mostly get by with just the subtitle descriptions. Cool vid. Here are maybe some additional that I see. Some could be seen as stretching it, so please take it for what it's worth and include/don't include whatever you want. Sorry if there are repeats from your vid. Unfortunately, I'm not so sure that your vid is correct by saying it is a 'hyperball scoop' (jai-alai xistera) in the armory. Looks more like leg armour or something to me. - Hidden mickey shape when Sam pulls the wings off the wall in order to jump and float down; right before where Flynn goes, "Radical man!" in response to Sam's jump. The hidden mickey is on the wall that the wings were hung on, imo. I find this hidden mickey better than the security camera earlier in the film. - The pillow and sheet on young Sam's bed feature the original Tron lightcycles. - In young Sam's room, there's a handheld game on the shelf that also has the Vincent robot. Is that the same game Flynn was playing in the original? - The view from outside the window into young Sam's room, just before Flynn is about to leave, features some original Tron style action figures in the window sill. 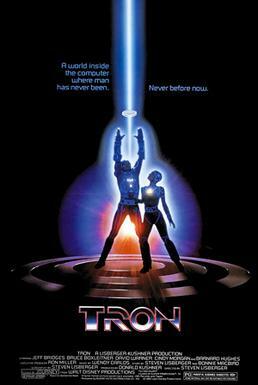 - A song by Journey (Separate Ways) plays at Flynn's in Tron Legacy, just like a song by Journey (Only Solutions) played at Flynn's in the original. - The guy that gets relegated to the Grid and then jumps ship says, "Erase me!". He could've just as easily used a less antiquated and more modern term like "Delete me," but I feel the use of 'erase' was a nod to Tron, like where Sark says, "So, we have erased the program that..." and I think Flynn might use 'erase' in the original? - There is a rainbowy lens flare type of effect used in many places throughout Tron Legacy. I feel it's a subtle nod to the rainbowy lens flare effect that gets cast from the tips of the suffusion rods that the Entry Port guards hold in the original Tron. - Solar sailer type vehicle in both movies (homage). - Sam says, "We gotta split 'em up!" during the Light Jet fight scene. Seems to be a nod to original Tron's, "This is Gold-1 to Gold-2 and 3. Split up. Take them one-on-one." Hrm, I never noticed the "Flynn humming" thing. If it's the part I think it is, I always thought it was a little "ta-da!" tune... now I'm going to have to pay attention when I watch it again. "Big door" scene-- both Flynns also use a code cracker to get the door open in the first place. I might also argue "security guard" encounters. This might be a stretch. But in T82, Lora/Alan/Flynn walk right past a security guard, who speaks to them and doesn't really notice Flynn. in T:L, we see a view from inside security command at Encom where Sam rides right past and Ernie doesn't really see him. I never caught all of the names of the competitors, even when they've been discussed here. Re: Castor's name-- I've long wondered if there might also be a play on the myth of Castor and Pollux. A lot could be read into it... including a speculation on future revelations. The humming is not precise but almost the same (it's slower than the film version). Combined with the figure lighting up, it has to be an homage. Most of the competitor names are very hard to see in the film, requiring freeze frame analysis (and, sometimes, reversing freeze frame images since they're on the other side of the hologram match board's ring). I was able to do a few of the names on my own, but the rest (plus the bike warriors names) came from a tronblr site. It's also quite possible some names have multiple meanings. If there's ever confirmation of one over the other, I'll revise things accordingly. The humming is totally an homage. - Another one is probably that Sark has the program version of "Peter" as his 'yes' man sidekick in Tron who he verbally abuses throughout. Clu 2.0 has Jarvis as his 'yes' man punching bag. - When Sam and Quorra stand in the I/O tower at the end, their pose is reminiscent of the old Tron poster. Wow, nice. I agree, bring on TRON 3! Please elaborate on the idea that the LOST numbers are easter eggs in Legacy. Seriously, am I going to have to freeze-frame every shot of a computer screen/monitor/display/tablet/sign/street sign/license plate in Legacy, again. I will still contend that this is the Hidden Mickey in Legacy. Neither the stairway camera nor the disc cabinet thing has ever reminded me of the Mouse. Even so, it's kind of a long shot. Honestly, I don't think there is really much of an official HM. Rectify Wrote:Wow, nice. I agree, bring on TRON 3! Please elaborate on the idea that the LOST numbers are easter eggs in Legacy. Seriously, am I going to have to freeze-frame every shot of a computer screen/monitor/display/tablet/sign/street sign/license plate in Legacy, again. The writers (who worked on Lost , I believe) said in an interview that the numbers were in the film somewhere. One correction: The author's speculation about the name "Wulf" is incorrect. The name was actually used in the fanfic "Fallen Away" written by TRON Sector's own Trace! Here's the link to the page. It's an awsome read, enjoy! I've reuploaded the video (haven't made any revisions or additions to the content yet) with the music track they didn't like removed- hopefully this one will stay up this time (and, if not, I'll just do a musicless version next).